Click through one of the best free Badminton ressources on the World Wide Web. Diemo Ruhnow's Badminton Training delivers everything you need to improve your or your players game. You will find a ton of tips and tricks about tecnique, how to hit and run on the court, important thoughts about tactic, how to do hints on strength and conditioning training and much much more ... all delivered by world class Badminton performance coaches. Navigate yourselves succesfull through Diemo Ruhnow's Badminton Coaching Website! This site is a new, awesome and completely free platform of information, not only for Badminton coaches but also for ambitious Badminton athletes as well as recreational Badminton players - it also serves as platform about Badminton equipment, seminares and training camps from different professionals throughout the world of Badminton. On the left site the different section of coaching and training contents is split up into the different categories "Basics", "Technique", "Tactic", "Strength", "Conditioning" and "Mental" - there you will find tons of information about how to elavate your or your athletes Badminton performance. In the upper section you will find an overview over different equipment, useful for players as well as equipment for coaches. You will also find an overview about seminars and training camps of Diemo Ruhnow and other professional coaches, as well as an overwiew about this site's partners and also the shop belonging to this site containing more stuff to elevate your knowledge and your performance in the game of Badminton. 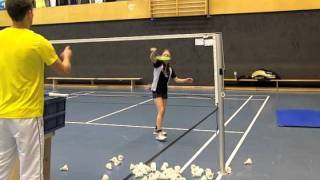 Enjoy the my site "Diemo Ruhnow's Badminton Coaching"